There are ten questions in this, the final mailbag of the 2018-19 offseason. Hooray for that. Spring Training begins next week and I can not wait. Remember to send your questions to RABmailbag (at) gmail (dot) com and I’ll get to as many as I can each week. Garrett asks: Are you surprised that the Yankees haven’t worked out an extension for Didi yet? There’s no way he plays the 2019 season at his current arbitration number without an extension right? Would there be any benefit to the Yankees in doing so? I am not surprised and for a few reasons. One, waiting to see how Didi Gregorius recovers from Tommy John surgery always made sense. The Yankees would be paying for an above-average two-way shortstop, but what if he loses some arm strength and is no longer an above-average fielder, or no longer able to play short? Two, the Yankees are over the $206M luxury tax threshold, so keeping costs down isn’t that big of a concern. They can pay Gregorius his entire $11.75M salary this year without it standing in the way of anything. And three, free agency is in bad shape right now. Gregorius has an argument for Jean Segura money (five years and $70M), but, after missing half a season to Tommy John surgery, his market might be limited next winter. With free agency being what it is today, why rush into a contract with Gregorius? The chances of a big money bidding war are slim. It could be the Yankees and Sir Didi are far apart in contract talks, far enough that letting Gregorius go out into free agency so he feels the squeeze is the best way to get him signed to a favorable deal. The Yankees have been stingy with extensions this century, which tells us they’re willing to pay large salaries down the road to reduce risk up front. They didn’t pay Chien-Ming Wang, he broke down, and they saved a bunch of money. Now, with free agency being what it is, the Yankees have even less of a reason to hand out extensions because those large salaries down the road might not be there, even if the player is healthy and productive. So no, at this point I’m not surprised they haven’t signed Didi yet. Adam asks (short version): While I completely understand the point of the low risk, low cost signing of Troy Tulowitzki, I don’t understand the notion that he’s already been penciled into the starting shortstop spot while DJ LeMahieu, signed for 24M/2yrs, is expected to platoon vs. LHP. Wouldn’t it be fair to expect LeMahieu to see more playing time between the two? Yeah, I don’t get that either. I mean, I totally get rolling the dice on Tulowitzki, but he hasn’t played in a year and a half, wasn’t good the last time he played, and he’s 34, so even if he were perfectly healthy last year, he’s at the point where you’d expect age-related decline. Teams are steering clear of free agents in their mid-30s these days, yet when a brand name like Tulowitzki becomes available for the minimum, half the league tries to sign him. Potentially getting something for nothing is a hell of a drug. Anyway, yeah, it sure seems to me the best possible 2019 Yankees team has Gleyber Torres at short and LeMahieu at second, with Tulowitzki in a utility role. I think LeMahieu is a better player than Tulowitzki — he might be the better hitter at this point and is almost certainly the better defender — and therefore should play every day. Like I said, I get rolling the dice on Tulowitzki. It’s basically zero risk. But if we get to the end of April and he’s stinking it up, I hope the Yankees would pull the plug. They shouldn’t feel obligated to stick with him for two or three months just because he was great a few years ago and badly wants to prove he can still contribute. Colin asks: In light of Miggy and Gleyber having both outperformed on power versus their prospect profiles, is it possible that the juiced balls have made contact tools significantly more valuable than power tools. Like if we regressed future WAR of 60 power prospects from 1990 to 2020, versus future WAR of 60 contact prospects on the same period do you think there would be a divergence in the last couple years? The hit tool has always been more important than the power tool and yes, I think the current state of baseball makes that more true than ever. First of all, contact is harder to come by nowadays because pitchers are so damn good, making the hit tool that much more valuable. Smaller ballparks and the ostensibly juiced baseball artificially inflate power numbers, and research has shown hitters with warning track power have benefited most from the current home run environment. You don’t need to be Aaron Judge or Giancarlo Stanton to hit the ball out of the park these days. Two things to keep in mind. One, there are still some physical limitations. LeMahieu has an above-average hit tool, but unless he starts hitting more balls in the air, he’s not going to hit for power. Some guys just don’t have the swing to generate the loft necessary to take advantage of that extra carry. And two, the league-wide increase in power is at least partial the result of outside factors. As recently as 2014 we were all wondering where the home runs and offense went. If the ball changes again and suddenly those warning track power guys go back to being true warning track power guys, power hitters like Judge and Stanton become that much more valuable. Given the current state of baseball, the hit tool is much more valuable than the power tool. The pendulum could swing back in the other direction at any moment though. Corey asks: I know Paxton threw one last year, but curious to year y’alls take on which Yankee is most likely (or capable to do so) to throw a no hitter or perfect game this year? Any pitcher could throw a no-hitter on any given day. You’ve got your good stuff working and your defense makes some plays? You could make history. Mike Fiers, Chris Heston, Phil Humber, and countless others are a testament to that. Among current Yankees, Luis Severino is the obvious pick to throw a no-hitter because he has the ability to dominate and overwhelm hitters. Run good Severino out there against the Orioles or Royals and something special could happen. James Paxton is similar to Severino in that regard. CC Sabathia has close to zero chance to throw a no-hitter at this point because he allows too many balls in play and so prone to infield singles and bloops. J.A. Happ is somewhat similar. Masahiro Tanaka is definitely a dark horse no-hitter candidate. When he’s at his best, he can cut through any lineup, and Tanaka at his best equals strikeouts and lazy fly balls, and lazy fly balls are easy outs. The Yankees have not had a no-hitter since David Cone’s perfect game in 1999. My hunch is, if we see one this year, it’ll be a combined perfect game because the Yankees don’t let their starters pitch deep into games and because the bullpen is so good. Alberto asks: As we all know, Troy is still being paid $38+MM by the Blue Jays & NYY will pay minimum MLB salary. So, what if a team wants to pay more than that? Say, “SFG” offered $2MM to play for them just to snag him from other teams or NYY could that ever happened or he has to be minimum $$ & choose team? It wouldn’t matter. Once Tulowitzki was released, whatever his next team pays him is subtracted from what the Blue Jays owe him, which is $20M in 2019. The Yankees will pay him $555,000 this year and Toronto the remaining $19.45M. If the Giants offered him $2M, they’d pay him $2M and the Blue Jays the remaining $18M. Another team could offer him, say, $22M, which would take the Blue Jays off the hook and increase Tulowitzki’s salary, but that’ll never happen. In cases like this, salary offered is irrelevant. Tulowitzki is getting his $20M. It doesn’t matter to him how teams are divvying that up. It’s still $20M at the end of the day. When players are released, where they go next comes down to preference and/or opportunity, not money. John asks: I was reading your thoughts a week before spring training today and was curious where Chad Green fell on the perceived velocity list. I know he was lauded in 2017 for having a fastball that played up higher than it registered. Did that fall last year? Was it ever a measured thing? The perceived velocity gain list is a giant bell curve. There are a few elites like Adam Ottavino, guys whose fastball looks 1+ mph faster than the radar gun reading on average because they get great extension and release the ball closer to the plate. There are also a handful of laggers, guys whose fastball plays down quite a bit because they don’t get good extension. The guys at the bottom of list are junkballers like Clayton Richard and Bartolo Colon. No change, for all intents and purposes. Green’s fastball last year was the same as his fastball the year before in terms of velocity and spin rate. To me, the biggest reason he went from otherworldly in 2017 to merely very good in 2018 is that the book is out on him now, and teams are better prepared for all those fastballs. Green could really use a reliable second pitch. I doesn’t need to be an Ottavino slider or a David Robertson curveball. Just something a little better than what he has now to keep hitters honest. Pete asks: What do you make of Judge’s comments from yesterday about voluntarily moving to CF to accommodate Harper in RF? Is that a bit of a slight towards Hicks? Thinks Hicks cares? 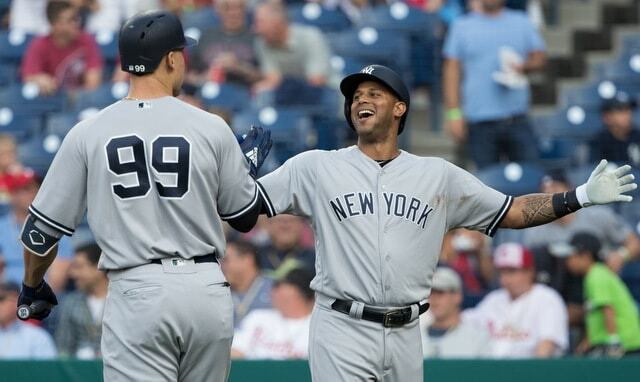 Aaron Hicks won’t care because a) I imagine he feels the same way, and b) Aaron Judge didn’t actually say he’d move to center to accommodate Bryce Harper. “Anytime you can add an MVP to a team, it’s going to make them better … Wherever he wants to play, wherever he wants to play — we’ll make it work,” is what Judge said to TMZ. That’s it. A completely innocuous statement that applies to every possible free agent signing or trade addition or minor league call-up ever. Judge gave the tabloids a nice little headline for a day or so and that’s about it. Nothing more to it. Bhavin asks: Provided Yankees are absolutely not signing Harper, do you think any of the remaining left handed bat is an option: Carlos Gonzalez, Derek Dietrich, Lucas Duda, Logan Morrison or Matt Joyce? Will asks: Would it be possible for the roster to expand to 26 players but for tanking (or plain cheap) teams to not use that roster spot? Obviously that would really be sticking it to the union and they would have to explain it to their fans but nothing would surprise me at this point. Nah. It’s in the Collective Bargaining Agreement that the 25-man active big league roster has to be full and I assume the same would apply to the 26-man roster. There is a little leeway — there were a few instances last season in which the Yankees sent a player down following a game, had a 24-man roster during an off-day, then called someone up before their next game — but not much. Certainly not enough to play an entire season a man short. It seems to me the MLBPA would be on solid legal ground to file and win a grievance in that case. Jeff asks (short version): I’d like to know if you think my theory holds water. The Yankees, by letting their veterans go in 2016 and giving increased time to their young’uns dramatically changed the nature of rebuilding — given that they were a .500-ish team at the time — and perhaps provided a new model for rebuilding that too many other teams have taken. Did this attitude exist prior to the Yankees of 2016? Did .500-ish teams ‘rebuild’ before that? Interesting! I do think that a prominent team like the Yankees throwing in the towel on a season like they did in 2016 — they were 50-48 and 4.5 games out of a postseason spot on the day of the Aroldis Chapman trade, which kicked off their mini-fire sale — could lead to other teams doing the same. “If the Yankees are doing it, why shouldn’t we?” That kinda thing. Teams aren’t even trying to get better. At first sign of adversity it’s “ah well, time to start over” these days. I don’t think we can solely blame the 2016 Yankees for that — I think the primary culprit are the owners who’ve concluded it’s more profitable to field a cheap bad team than an expensive good team — but they did trade away veterans while not yet completely out of the race, so they probably contributed to it to some extent. When a huge market team like the Yankees says it’s okay to take a step back and get younger, other teams will inevitably follow suit.